It adopts advanced hot wedge structure, With its high power, high speed and pressure. Geomembrane wedge welder is a new welding machine which is developed by our company. They can weld geo-membrane of various thickness and are applicable for welding of all thermal-fused material such as LDPE, PVC, HDPE, EVA, PP and PVC、HDPE、EVA、PP. The control of this series adopts PID automatic thermostatic control with high control and low temperature fluctuation. Speed control of this series adopts PWM automatic voltage and regulation speed circuit. Direct current servo the motor drive with great output torque and staple performance in walking. It can maintain a constant speed on the condition of creeping, vertical creeping and road load. Also this series of welding machine is stable in performance despite of external temperature and voltage variation. 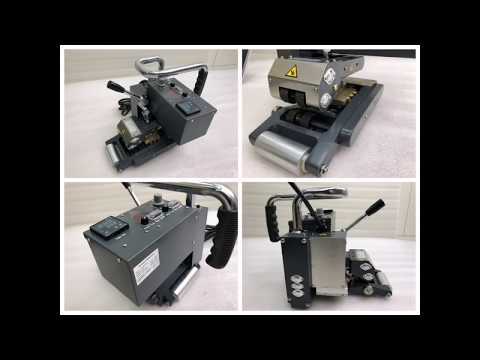 This series of Geomembrane Wedge Welder is excellent in performance and easy for operating, with high welding speed and good work quality.